Preheat oven to 350 degrees. Grease a large baking sheet. Beat the egg with a fork until smooth. Add peanut butter, sweetener, vanilla, baking powder, and baking soda and mix well. Stir in chocolate chips if using. Shape tablespoonfuls of dough into 34 balls and place 2 inches apart on baking sheet. Flatten the balls with a fork, making a crosshatch design on each cookie. (Cookies will have a diameter of about 2 inches and will not spread much.) Bake for about 15 minutes or until firm and browned. Let cool for a few minutes before removing from pan. Refrigerate natural peanut butter after stirring and the oil will not separate. Important Update: I have had trouble with this recipe when the peanut butter was too runny, as it makes the cookies very fragile. I suspect that some brands may have started using more oil in proportion to nuts to make a cheaper product. I’m going to try draining off some of the oil that rises to the top of the jar if I get a thin one again. Help Santa lose his jelly belly by leaving him a plate of these tasty treats, filled with bright jam or rich chocolate. Cream the butter with an electric mixer, then blend in the sweetener, egg yolk, and vanilla extract. Whisk the almond flour together with the baking powder and salt. Stir into the butter mixture until smooth. Refrigerate for 1 hour. Shape dough into 1-inch diameter balls and roll in chopped almonds. Place on a large cookie sheet. Make an impression in each ball with your thumb. Return to the refrigerator for 15 minutes. Bake cookies for 18 to 20 minutes or until lightly browned and baked through. While still hot, fill the cavities with a teaspoon of jam. Return to oven for 2 or 3 minutes to melt jam. Instead of jam, fill the centers of the hot cookies with chopped, sugar-free chocolate chips or chocolate bars, such as Choco Perfection. Return to oven briefly if necessary to melt chocolate. Almond, Chocolate, Jelly, Peanut butter. Bookmark. Judy, I have so many different sweeteners in my pantry including Wax Orchards Fruit Sweet used by you in Carb Wars. 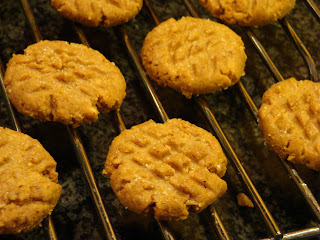 I appreciate learning about another product like a brown sugar replacement, as used in your peanut butter cookies. But I have to wonder how I've led such a long low carb life style without such products, and why life can't be simpler. The problem is that so many of these useful low-carb products are mostly unavailable at local stores, and until I've found them on the internet, ordered, and waited for them to arrive, I can't make the cookies. So I only make cookies with ingredients in my pantry and forget about the brown sugar replacement products until next time I find them in a recipe. Won't it be wonderful when low-carb is the in diet, low fat foods are in the minority, healthy organic candies are banished to the bottom row, and brown sugar substitutes are readily available? Yes. Dream on. I know what you mean. My hope is that once manufacturers know that there is a demand, the products will become more readily available. In most of my new recipes that need brown sugar I've given several options. Some of my favorites are only available by mail or online order, but some are easier to find. Diabetisweet Brown, for example, can be purchased at many stores that sell diabetes supplies and Just Like Sugar Brown may be in stock at Whole Foods Markets. Health food stores also sometimes carry good sugar replacements and they can probably order the brown sugar versions for you. Another option is to use regular sugar-free sweetener and add a little yacon syrup (at natural foods stores), or black strap molasses for taste. You'll add a few carbs with the molasses. We all need to keep asking for the products we want in order to create a demand. comment but aftеr I clicκeԁ submit my comment dіdn't appear. Grrrr… well I'm not wrіtіng all thаt οver agаіn.